Although ED is observed in patients on he­modialysis (HD) in Iran, there are no reports on its prevalence. Screening for ED among HD patients could recognize patients at risk and they can benefit from specific interventions. We conducted this study for determination of the frequency and severity of ED in HD pa­tients using the International Index of Erectile Dysfunction (IIEF) questionnaire. This was a cross-sectional study based on data collected by random sampling from HD patients at two HD centers in Shiraz, Iran, in the year 2007. We recruited 73 chronic HD (≥3 months) patients. Exclusion criteria were: history of infection, acute complications from uremia, substance abuse, uncontrolled conges­tive heart failure (greater than New York Heart Association functional class II), and poorly con­trolled diabetes (12 patients were excluded). Patient population included adults with an age­range of 18-70 years. The protocol was ana­lyzed and approved by the research chancellor of Shiraz University of Medical Sciences. Laboratory parameters, which were obtained by mid-week pre-dialysis blood samples, inclu­ded the following: blood urea nitrogen (BUN), serum creatinine (Cr), hemoglobin (Hb), cho­lesterol, triglyceride (TG) and blood sugar. Kt/V was calculated from values of pre- and post­dialysis BUN and body weight. Patient demo­graphics, marital status, duration on HD, pri­mary renal disease, co-existent diseases and medications in use were also documented. All the patients gave written informed consent. We used a brief version from the ED domain of the IIEF questionnaire which was translated into Farsi and modified according to validation tests. In the IIEF questionnaire, the score for each item ranges from five for normal erection to one for no erection. IIEF rates erectile func­tion as absence of ED (score: 21-25), mild ED (score: 16-20), moderate ED (score: 11-15) and severe ED (score: 5-10). Data were analyzed using Statistical Package for the Social Sciences software, version 15.0 (SPSS Inc., Chicago, IL, USA). The difference between patients with and without ED was eva­luated using the Chi-square test. Comparison of the quantitative data was made using the Mann-Whitney and Kruskal-Wallis tests as non-parametric tests. Correlation between quan­titative data was determined by Pearson's cor­relation coefficient (Spearman's rho as non­parametric correlation coefficient). A P value of <0.05 was considered significant. The present study was conducted on 73 pa­tients on chronic HD. The mean age of our patients was 55.4 ± 16.1 years. The underlying etiology of renal failure included hypertension in 24 patients (32.9%), diabetic nephropathy in 18 (24.6%), miscellaneous in 18 (24.6%), renal stone disease in eight (11%), and unknown in five (6.8%). In the study group, 78.3, 82 and 4.3% patients were on anti-hypertensive drugs, anti-hyperglycemic drugs and anti-hyperlipide­mic drugs, respectively. Only 10 patients did not use any medications. There was no signi­ficant difference between the prevalence of ED and the usage of medications (P > 0.05). The patients had been on HD for 33.2 ± 10.3 months. Demographic and biochemical data of the study group are summarized in [Table 1]. 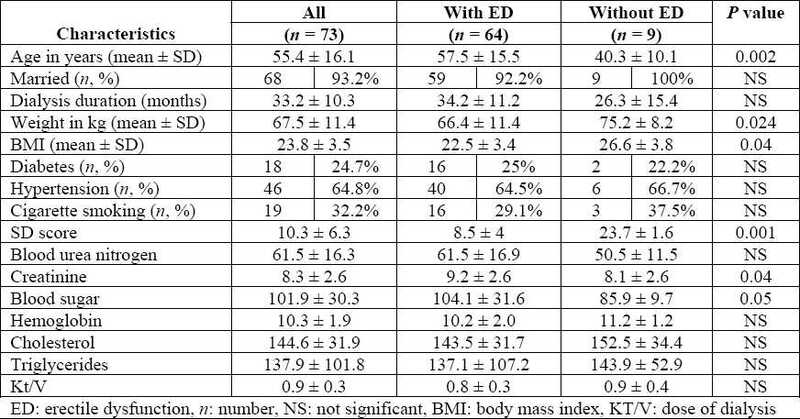 In this study, patients with ED had significantly lower pre-dialysis weight, lower body mass index (BMI), higher age, higher blood sugar levels and higher pre-dialysis serum Cr (P < 0.05). The total score of ED was 10.3 ± 6.3 in the studied patients. The prevalence of ED of any degree was 87.7% (64/73) in the studied pa­tients [Table 2]. There was a significant corre­lation between different degrees of ED and age of the patient (Kruskal-Wallis test, P = 0.002). Table 2: Prevalence and severity of erectile dysfunction in different age groups. We compared all the analyses in the two groups: patients with ED and those without ED. The prevalence of ED in patients younger than 50 years and >50 years was 70.8 and 95.9%, respectively. The prevalence was signi­ficantly higher in patients >50 years old (Chi­square test, P = 0.005). The prevalence of se­vere ED was significantly higher in patients >50 years old (36, 78.3%) (Chi-square test, P = 0.01). Only 11 of the 73 patients (15.3%) had a Kt/V index ≥1.2, indicating adequate dialysis. The ED was more common in those who had Kt/V <1.2 compared with those who had Kt/V index ≥1.2 (Mann-Whitney test, P = 0.04). Among the HD patients who had inadequate dialysis, there was a higher probability of severe ED (Chi-square test, P = 0045). Analysis of the demographic data revealed that patients with ED had significantly higher age, lower pre-dialysis weight and lower BMI (Mann-Whitney test, P = 0.002, P = 0.02, P = 0.04, respectively). In clinical data, patients with ED had significantly higher pre-dialysis serum Cr and blood sugar levels (Mann-Whit­ney test, P = 0.04, P = 0.05, respectively). There was no significant correlation between total ED score and quantitative data among the study patients (P > 0.05), except age (Pearson's correlation coefficient, r = -0.5, P = 0.001). In patients with ED, there was a significant cor­relation between total ED score and age (Spear­man's rho correlation coefficient, r = -0.5, P = 0.001) and post-dialysis BUN (Spearman's rho correlation coefficient, r = -0.3, P = 0.03). In this study, patients with a Kt/V of <1.2 had more ED. A study from Brazil reported that patients with ED showed significantly lower Kt/V. However, few other studies have re­ported that HD patients with adequate dialysis had a higher likelihood of presenting with ED, suggesting that HD may remove compounds from the serum that are important for adequate erection or, a high Kt/V may be a marker of patients with more severe disease who are receiving more HD. On the other hand, some studies have reported no significant associa­tion between Kt/V index and prevalence of ED. , Our findings in this study indicate that adequate HD may contribute to prevent ED. Further studies are required to clarify this dis­crepancy. In this study, patients with ED had signi­ficantly lower pre-dialysis weight and BMI, and high blood sugar levels. However, other studies have not reported this association. Low hemoglobin levels have been reported to be significantly associated with ED. , It may be argued that anemia could participate in the etiology of erectile problems in HD patients because it worsens the overall general con­dition in those patients. But in our study, there was no correlation between hemoglobin level and ED. In conclusion, a significant number of our HD patients presented with ED of varying degrees. This problem adversely affects their quality of life. Thus, ED should be considered as a major health concern in this population. Our results may provide basic data for future research in this field, especially in other centers. This study was funded by The Shiraz Nephro­Urology Research Center of Shiraz University of Medical Sciences. 1. Messina LE, Claro JA, Nardozza A, Andrade E, Ortiz V, Srougi M. Erectile dysfunction in patients with chronic renal failure. Int Braz J Urol 2007;33:673-8. 2. Neto AF, de Freitas Rodrigues MA, Saraiva Fittipaldi JA, Moreira ED Jr. The epidemio­logy of erectile dysfunction and its correlates in men with chronic renal failure on hemo­dialysis in Londrina, southern Brazil. Int J Impot Res 2002;14: 19-26. 3. Coelho-Marques FZ, Wagner MB, de Figuei­redo CE, d'Avila DO. Quality of life and sexuality in chronic dialysis female patients. Int J Impot Res 2006;18:539-43. 4. Miyata Y, Shindo K, Matsuya F, et al. Erectile dysfunction in hemodialysis patients with dia­betes mellitus: Association with age and hemo­globin A1c levels. Int J Urol 2004;11:530-4. 5. Arslan D, Aslan G, Sifil A et al. Sexual dys­function in male patients on hemodialysis: assess­ment with the International Index of Erectile Function (IIEF). Int J Impot Res 2002;14:539- 42. 6. Peng YS, Chiang CK, Hung KY, et al. The asso­ciation of higher depressive symptoms and sexual dysfunction in male haemodialysis pa­tients. Nephrol Dial Transplant 2007;22:857-­61. 7. Soykan A, Boztas H, Kutlay S, et al. Do sexual dysfunctions get better during dialysis? Results of a six-month prospective follow-up study from Turkey. Int J Impot Res 2005; 17:359-63. 8. Krishnan R, Izatt S, Bargman JM, Oreopoulos D. Prevalence and determinants of erectile dysfunction in patients on peritoneal dialysis. Int Urol Nephrol 2003;35:553-6. 9. Daurgidas JT. Second-generation logarithmic estimates of single- pool variable volume of Kt/V: an analysis of error. J Am Soc Nephrol 1993;4:1204-13. Ahmet TunÃ§kiran, M. and Burak HoÅŸcan, M.
2 Does vitamin D deficiency contribute to erectile dysfunction? Sorenson, M.B. and Grant, W.B.